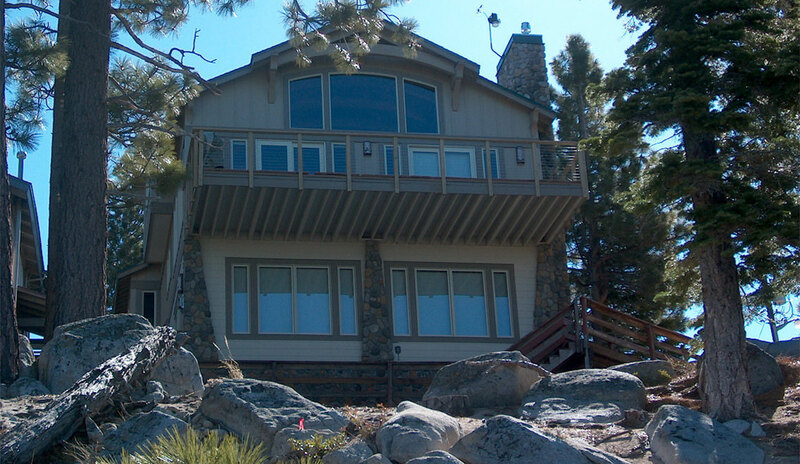 The Pavich Residence was a total tear down of an existing residence on the shore of Lake Tahoe. The owner wanted to maximize views to the lake that the original home designed in the 1960’s did not take into the design consideration. To accomplish such a project in a Tahoe Regional Planning Agency “Shore Zone” many factors had to be accounted for, and therefore, required added levels of sensitivity on the part of the designer. The Shore Zone of Lake Tahoe is a resource of regional significance. As such, our residential designer was careful to focus on the design of the home as seen from the lake and consider issues such as footprint area, height, overall area of the façade, glass reflectivity, colors and materials, as well as the visual vulnerability of the shoreline. The project was approved by the Tahoe Regional Planning Agency, construction is complete, and the Owners are now enjoying their magnificent views of Lake Tahoe. The Owner desired a craftsman-style “ski-out” residence at the base of Heavenly Ski Resort. However, the proposed project site was more cliff than lot causing considerable architectural and engineering design challenges. Our residential designer conformed the building to the natural topography rather than altering the natural topography to accommodate the structure. We proposed a single-story element on the high or road side of the project and a three-story element totally 50-feet in height on the low or ski slope side. The project has been constructed and met the Owner’s dream for a “ski-out” residence. The project design blends with the natural terrain and preserves the character some of the finest ski slopes in Tahoe. The Owner desired a “Mediterranean Style” home in the gated golf community of Thunder Canyon in Washoe Valley, Nevada that blends into the nature’s landscape. R.O. Anderson took into consideration the architectural features traditionally found in Mediterranean countries, such as low-pitched tile roofs and arched windows and openings and incorporated them into the design. The two story home features an open plan with Spanish tile roofing stucco siding and features stone balusters at the expansive rear second story deck area overlooking the Thunder Canyon Golf course. The Tribble Duplex Project had a limited lot size that came with several large obstacles. Existing rock outcroppings were located on the project site that could not be moved. R.O. Anderson incorporated the natural features of the rock outcroppings into the project. These outcroppings actually were used in some areas to structurally support the home. By integrating these features into the project, the Owner’s goal to maximize the site area was achieved in the final design. Additionally, the project resulted in an unusual and harmonious design between the built and natural environment. Residential design services were needed for a custom home located on a 5-acre parcel in the gated community of Job’s Peak Ranch in Douglas County, Nevada. The pristine environment of Job’s Peak Ranch necessitates residences to co-exist with the wildlife and nature attributes of the Sierra Range. Therefore, all designs are reviewed by the Job’s Peak Ranch Architectural and Landscape Council. In conformance with the established design guidelines, our residential designer created a design that took advantage of the unbelievable views while blending into the natural environment. The natural wood siding selected was in harmony with the surrounding landscape and roofing materials complied with fire protection district codes. The final product was a 7,000 square foot, two story “Craftsmen Style” home which takes advantage of several view corridors through the pines to the beautiful Carson Valley. It features a separate “granny flat” and utilizes interlocking beam work at the entry and front porch. The residence was constructed with clear cedar siding with a natural stone wainscot and oversized column bases. 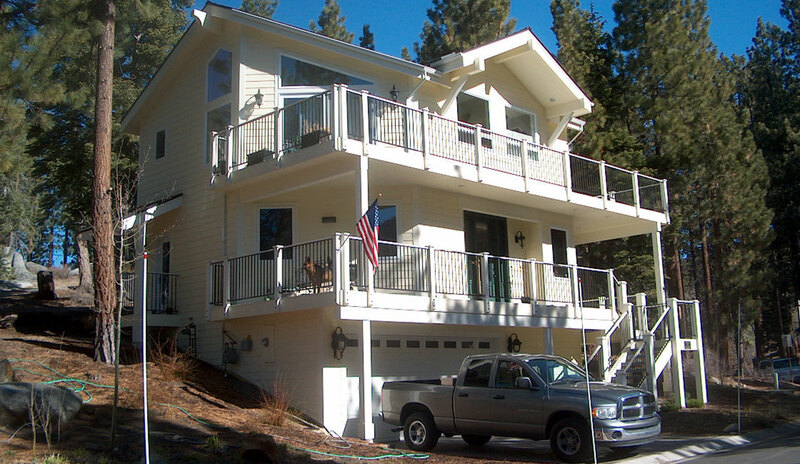 The Brockett Residence, located in the Tahoe Basin, had a very limited Tahoe Regional Planning Agency approved coverage area of 1,466 square feet. Each parcel in the Tahoe basin is only allowed to have a certain percentage of its total area covered. This ensures that some open space is protected on every parcel. However, the owner desired a spacious addition to the existing residence. In order to maximize the client’s desire for a larger home, a three-story design was employed. Our residential designer ensured that design elements of the new construction were compatible with the natural, scenic, and recreational values of the neighborhood. The final construction consisted of approximately 2,000 square feet of living are with a garage of approximately 1,000 square feet. The architectural considerations included a low pitch roof that complied with Tahoe Regional Planning Agency height restrictions.